In continuous production since May, 1985, Balance is universally esteemed as one of the world’s premier turntable designs…and one of the most enduring. Although its basic concept remains unchanged, Balance has enjoyed a series of enhancements which has kept its performance “State of the Art” for more than three decades: an unprecedented achievement in High End Audio. (For a history of Balance’s extraordinary evolution, please request a copy of our brochure “A Question of Balance”) Proof of its excellence, Balance is utilized as the absolute reference turntable by manufacturers, reviewers, mastering engineers and magazines worldwide, and has earned virtually every prestigious HiFi award. Inspired by Leica, whose classic rangefinder cameras embody the same standards of perfection and design longevity, Brinkmann proudly announces our “33-1/3 Anniversary” Balance. Limited to 33 sequentially numbered, two-arm ‘tables, this Collector’s Edition features unique engraving on the arm base, identifying it as unique. Our Special Edition comes with every option imaginable: a 12.1 Tonearm (the second base will be drilled for customer’s choice of arm), RöNt II outfitted with NOS (original British) Mullard tubes for superior sonics, a custom version of HRS’ latest “Reference-series” Isolation Base and a richly illustrated “Coffee Table Book,” autographed by Helmut, detailing the history of Brinkmann and Balance. For devotees of Brinkmann, or for those connoisseurs who demand the best, this Balance is the finest turntable we know how to make. “33rd Anniversary” Edition: The Collectible Balance. - Limited to 33 sequentially-numbered turntables: 01/33-33/33. - All 33 Anniversary units are “2-arm” Balances. - Includes one Brinkmann 12.1. The second base will be prepared for the customer’s choice of arm. 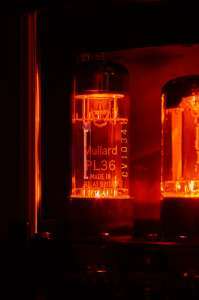 - RöNt II Power supply with selected NOS (original UK) Mullard tubes for ultimate sound. 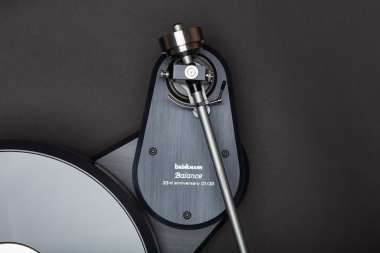 - Specifically developed HRS Isolation Base, effective from Subsonic to 40KHz, Engraved with Brinkmann and HRS logos. - Deluxe “Coffee Table Book” signed by Helmut, detailing the 33-year history of Brinkmann Audio and the Balance, with rich photography featuring Brinkmann Audio products. - Delivered in custom flight cases.